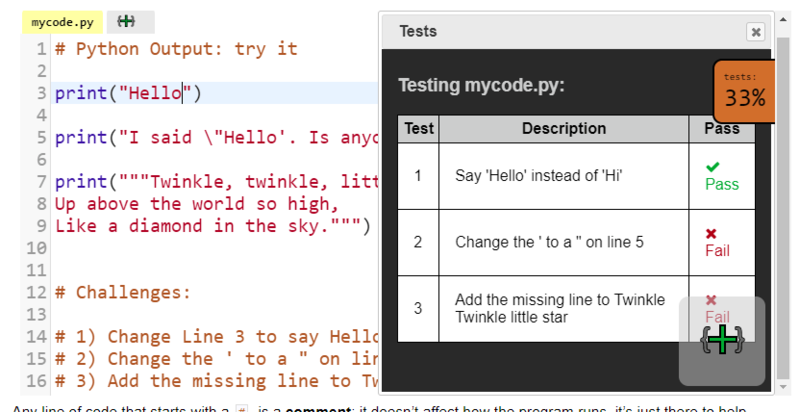 For each of the tryit, debugit and extendit activities, you’ll get an interactive python code editor that runs in the browser on any device. As you work through the challenges in each code editor, you get a score in the top right corner of the screen showing your progress so far. Ctrl+S to save your code to a unique URL, that you can submit to your teacher as proof of having done your homework / classwork or keep for your own records. If you have any suggestions or if you’ve spotted something I’ve done wrong, please get in touch via the comments below or the contact page. Really nice resource, love the accessibility, layout, tasks, everything really. More than happy to point them out if you let me know where and how. Brilliant resource. Thank you for sharing. The kids love the certificate at the end and it’s a great way to track progress. Great resources! Thank you for doing this! Looking forward to the next ones!